The SupaScooter Sumo is a popular portable unit with a large 200kg load capacity. Suitable for not only portability and travel, but for use within confined spaces and homes. The SupaScoota Sumo can be taken almost anywhere with its dual motor which makes light work of pavements and steep hills. Like all SupaScooters, this unit features a tight turning circle for indoors spaces, and a large travelling distance of up to 10km (standard SLA battery). The optional lithium battery has a range of 13km, and the scooter frame has capacity for an optional second battery for added range. The unit features a super light split frame design (heaviest part only 13kg) with seat suspension . 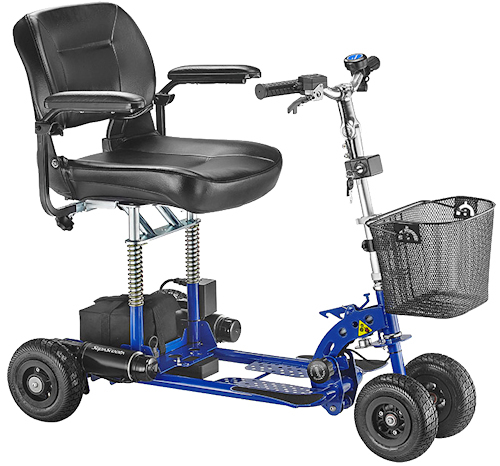 A Sport version of the scooter is available with larger 260 x 85 pneumatic tires on the rear. Lightweight, portable design – folds in under 10 seconds!